Will Dalai Lama meeting hurt Sino-U.S. ties? GPS intern Aakanksha Tangri speaks with Robert Oxnam, President Emeritus of the Asia Society, about the Dalai Lama’s recent visit to the United States, and what it could mean for relations with China. What are the likely short-term and long-term impacts on U.S.-China relations after President Barack Obama’s meeting with the Dalai Lama? It’s important to note that every U.S. president from Reagan onward has had meetings in the White House with the Dalai Lama. Clinton had four meetings with His Holiness during his presidency. Both Clinton and Bush have had post-presidency meetings as well. Indeed the Dalai Lama recently said “I love George Bush.” So, in 2009, when President Obama did not meet with the Dalai Lama, he was breaking a well-established precedent; and thus his 2014 meeting simply reverted to an older pattern. 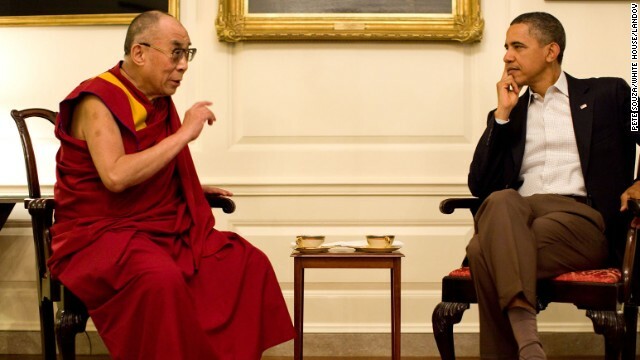 It’s worth noting that Obama has now had three meetings with the Dalai Lama. Of course, the Chinese always protest loudly on these occasions because they have a strong interest in asserting Chinese sovereignty over what they call the Tibetan Autonomous Region. But since Obama explicitly said that neither the United States, nor even the Dalai Lama, wants full independence for Tibet, the sovereignty issue was sidestepped. Should we be reading anything into the White House hosting the Dalai Lama in the Map Room instead of the Oval Office? I wouldn’t read a lot into the choice of the Map Room. I suppose it conveyed a slightly-less official venue, but it wasn’t a blatant snub of the Dalai Lama, nor was it likely to placate Chinese critics. Certainly it was not designed, as some have suggested, to indicate that Obama was trying to redraw the map of China. Hua Chunying, a Chinese foreign ministry spokeswoman, said in a press briefing that “Any country bent on impairing China's interests will find its own interests get hurt in the very end, and its relationship with China will be damaged.” Is this just talk or will there be retaliation toward America from China’s side? So far, there is no indication whatsoever that the Dalai Lama’s visit to the White House has led to a deterioration in U.S.-China relations. In recent days, China has had high-level military talks with the U.S. Army Chief of Staff Ray Odierno. And it appears that President Obama and President Xi Jinping will meet at a nuclear security summit in the Netherlands this month. What role can cultural diplomacy playing in advancing U.S.-China relations? Ever since U.S.-China détente in 1972 and normalization of relations in 1979, cultural diplomacy has been a crucial factor on both sides. By “cultural diplomacy,” I mean not just art exhibitions, performing art exchanges, and sports events, but also the enormous flow of people and information between our two governments and our two societies. In so many ways, the U.S.-China relationship has been shaped by government-facilitated science and technology exchanges, student and scholar flows in both directions, trade missions and business connections. What I’m saying is that “culture” is how people relate and understand each other. In this sense, people-to-people diplomacy is critical to any diplomatic interaction and, in this respect, the U.S.-China relationship has been extraordinarily successful. Let me also say that, ever since the famous opening relations back in the 1970s, both sides have become acutely sensitive to key issues – both the hot buttons and the soft buttons. Neither side has avoided speaking frankly about problem areas, but we’ve found ways to keep the relationship on track by coping with problems – including Taiwan and Tibet. So, the Dalai Lama’s visits to the White House under the most recent five presidents (Reagan, Bush 41, Clinton, Bush 43, Obama) always yields fiery responses from Beijing, but has never caused a deep disruption in U.S.-China relations. And it won't. China is known for it's hyperbole and propaganda. Gee, I wasn't aware we still made any ties here, or any other items of clothing for that matter. Not sure what that has to do with our past and present presidents meeting the Dalai Lama had to do with relations with China, as our trade with China has expanded in those years, but okay. Clumsily written, but I hope you get my gist. Aww. China's gonna cry. Again. To many Chinese people the Dalai Lama is not simply a peaceful monk. They view him through a historical prism. To them the Dalai Lama was a turn coat, a serf owner and a CIA agent. The president's meeting with him invites ridicules. You've been saying that since Reagan and his successors, who have all met the DL, right? Right? @ alex2002, the POTUS is ridiculed no matter what he does so he should go with HIS conscience! The Dalai Lama initiated social reforms in Tibet and has not deviated from his aspiration to help the downtrodden since his youth– indeed he is wont to say that while the Chinese Communist Party members have trimmed their sail to the prevailing fascist winds he has held true to his youthful ideals of common and community welfare. The Dalai Lama may be regarded by Chinese Communist colonial powers as a "turncoat", he has forced Tibetans to accept Democracy in the face of Tibetan criticism of democracy being a tool for crooks and gangsters and the ignorant in an environment controlled by Chinese Communist Party; and while he lived on a simple daily allowance he has had accepted US government donations to help Tibetans who were forced for the first time in Tibet's millenia history to become strangers in strange lands. To me what is educational is the antagonism and the enmity aroused by the Dalai Lama's teaching of compassion and rationality in religion. Britain got its fingers burned, when David Cameron met with Dalai Lama in 2012. Relations became frosty, trade talks were put on hold and British visitors were snubbed by Beijing officials. Last December Cameron did his best to calm the waters, when he visited China. Chinese government is by its evolution a bully. It will attack everyone that is in their way but they do respect few of the oppositions who are brave enough to stand up to them. Unfortunately, all the western powers have kowtow to the Chinese power and only U.S. remains.